I cannot stay quiet about this any longer. You see, I love Subway. I eat there every chance I get. So much so in fact, that I hate complaining about them in any fashion, but it has become so serious that I feel I have a duty to say something. Their current ads are infecting my waking mind and I am truly afraid that if I don’t get them out of my brain they will only pollute my conscious self to the extent that I will not be able to eat there again. And that would be a terrible thing, for I love their sandwiches. 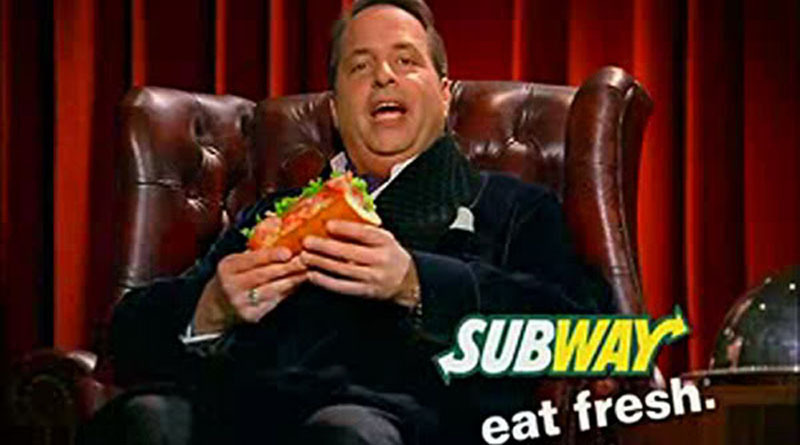 Once and for all, please tell me why in all that is good and beautiful were Jon Lovitz and his character “Master Thespian” hired to sell Subway sandwiches to me? I cannot stand it. The line “Eat Fresh”…..which I personally think is great….has now become a grating echo in my head. A slogan, that was once a pleasant and reassuring promise of quality and good eating, now sounds exclusively like Lovitz’s character. Eat FreshhHH! Why are you doing this to me Subway? I don’t know how much longer I can take it. Don’t get me wrong. This is not a personal vendetta against Jon Lovitz. He’s a funny guy. Did you see him in “A League of Their Own?” Funny, very funny. How about “Rat Race?” Appropriately stupid but still, well cast. I don’t even have anything against the actual character “Master Thespian.” I enjoyed him on “Saturday Night Live.” Really, I did. I even liked “Tommy Flanagan”, Lovitz’s pathological liar character. I do not have any bias against the man. I just hate that he has become “the voice” of Subway inside my head. Eat FreshhHH! Lovitz has even admitted the character of “Master Thespian” was based on a very arrogant drama professor he had while in university. I believe it. So why is Subway aligning itself with a jerk? Sure, as a character he’s funny, I’ll give you that, but in a specific way. I would laugh AT him. But if he was selling something I wouldn’t buy it simply because he was selling it. Why Subway, why? They have Jared. I like Jared. Admittedly we share a similarity in name but that is not the reason for my affinity toward his spots. He is so gorky-everyman that one can’t help but believe anything he says. He was fat, decided to lose weight and then proceeded to live on Subway sandwiches three meals a day. Isn’t that the American (or even Canadian) dream? Of course it is. He didn’t even run – he walked! A diet of fast food? It’s only the most perfect weight loss plan I’ve ever heard of. Come on. It’s a no-brainer. The guy’s a flippin’ hero. It’s no wonder they sell more sandwiches every time Jared’s mug hits the screen (really, it’s true, I checked it out). Look, I don’t want Jon Lovitz to lose a job. He’s got bills to pay. Maybe AFLAC could fire the duck and hire him. Perhaps Zellers needs some help. Starbucks? As things stand this is one case where I hope the brand is stronger than the ad. I still love to eat their food, and “Jared” commercials do run from time to time, so it’s not like I’ll have to suffer total withdrawal. For now though, I will endeavor to change channels every time “Master Thespian’s Dinner Theatre” aims a submarine sandwich my way and try my very best to exorcise that voice – Eat FreshhhhHHHH! – from deep within my psyche. Maybe if I hum “I’m Lovin’It” over and over and over…….